Have you ever wanted to paint the town red? THQ’s action puzzler, de Blob, allows you to do just that to Chroma City. You’ll even be encouraged to do it because by painting the town red (and other colors), you’ll help restore color that the monochromatic I.N.K.T. Corporation leeched away. You’ll play as de Blob to defeat different hordes of tank battalions, speedy racers, and elite soldiers sent by the I.N.K.T. and bring back color to the stripped city. Fans of Roland, Super Monkey Ball, and Edge will greatly enjoy de Blob. You’ll control de Blob and move him around the grey city. The basic goals of the game are to restore color and defeat or avoid the opposition. The goals you’ll complete along the way include coloring buildings with specific colors, running over I.N.K.T. agents, and performing challenges issues by revolutionaries. 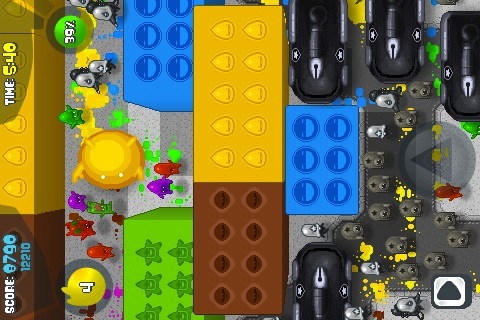 To get certain colors, you may need to mix colors by crushing different combinations of leftover, colored leech bots. You’ll also need to pass blocks to score different points within the time limit in order to pass through different gates within the city. Score extra points by finding the 4 hidden letters to spell the word “Blob”. You will bounce, resize, and change de Blob to slowly bring back color to the city. Controls are intuitive and easy to use. You can use the pointer controls: you touch the screen with your finger to drag and drop de Blob to your desired spot. And what’s nice is that you can gain speed boosts by moving several times. The app also takes advantage of the iPhone and iPod Touch’s accelerometer feature so if you don’t like using pointer controls, you can use the tilt controls to move de Blob. To gain a speed boost, you can increase the amount of tilting you do. The tilt controls can also be disabled and calibrated easily by accessing the pause button. Users can also combine both the tilt and pointer control methods. During play, you can save your game by accessing the pause menu, but I’d like to see an autosave feature with future updates. This is one fun, polished app. I especially enjoyed the soundtrack and sound effects. The “splat” that resounds is very satisfying, and contributes to the fantastic gameplay experience. Those who don’t enjoy sound effects can also easily change the volume. The concept of this game is very original and the graphics are brilliant. I’m glad THQ decided to release a version for the iPhone and iPod Touch along with its release for the Wii and DS. I just wish this version looks as good as the 3D version for the gaming consoles. De Blob offers a fair mix of humor and detail. The transformation of Chroma city from grey to a rainbow of colors is great fun to watch and better to play. Overall, de Blob is a great buy for those who enjoy hybrid puzzler/action games. If you don’t mind repetitive play and movements, then there’s a good chance you’ll enjoy this game. With future updates, developers should consider integrating with OpenFeint and offer online leaderboards. It would also be nice to have more hidden secrets or minigames within the game to break up the play and capture the interest of those who find the game repetitive and boring. The controls could also be improved by allowing the user to adjust the sensitivity of the user’s touch. This would do much to give the user finer control of de Blob’s movements. It would also be nice if users could collect more trophies and achievements and brag about it to their friends. Although it would be nice to have these features, users should not expect updates to come anytime soon (if ever) because the game was released back in 2008. Consider de Blob as color therapy and bust your stress for $3.99 for the full version. It offers both cost and replay value. De Blob also comes in a free Lite version which allows you to play a tutorial, the first level, and 4 additional challenges. Users should download this lite version to practice the tutorial or if they’re on the fence about buying the full version. AppSafari review of de Blob was written by Linda Ta on April 1st, 2010 and categorized under Action, App Store, Fun, Games, Puzzler. Page viewed 3803 times, 1 so far today. Need help on using these apps? Please read the Help Page.